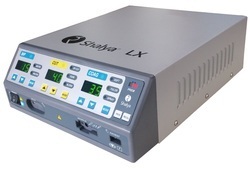 Prominent & Leading Exporter from Mumbai, we offer diathermy unit for urology, urology electro surgery unit, bipolar cautery unit, touch screen electrosurgery unit, electrosurgical generator and hf cautery machine. 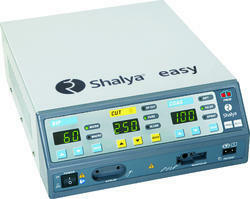 An advanced 300W ESU having best patient Safety feature with PREM, bicoag alarm, Self diagnosis, autostop. 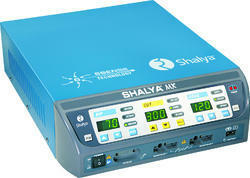 This economical electrosurgical unit provides both bipolar & monopolar options for surgery. • All other general surgical procedures for Breast, skin, and soft tissue, Head and neck, including trauma, vascular, endocrine, congenital and oncologic disorders. The most successful Touch Screen Electrosurgery Unit with combined vessel sealing system & Saline plasma Resection Unit having Touch screen 5.7” TFT panel operation for flexible use. 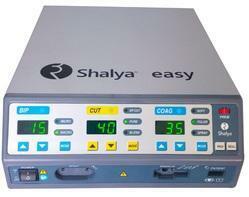 7 autocut & coag modes for efficient and precise surgerical operation. 5 bipolar modes for microsurgery. Selfdemo mode to describe the functions of esu. 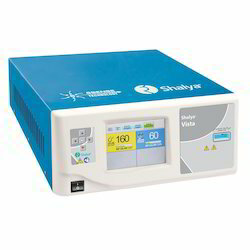 We are manufacturer and suppliers of HF Cautery Machine designed at 500Khz(460 khz) frequency having High Performance ESU(Diathermy) with Vessel Sealing System & Saline PlasmaBipolar Resection, in Single Unit. Within touchscreen model, this is the most advanced model provided by us having features like Remote field sterile , Auto load the last settings, 2 monopolar connection. • All other general surgical procedures. for Breast, skin, and soft tissue,Head and neck, including trauma, vascular, endocrine, congenital and oncologic disorders. This high functioning generator has capacity to store upto 10 surgical cases. For all the surgeries that are performed under fluid medium like Transutheral Resection of Prostate,Trans Cervical Resection of Endometrium, Hysteroscopy, Arthroscopic Surgery, Underwater Endomucosal Resection. 3 Cut Modes . Max Power - 300W with blend cut for additional hemostatis. 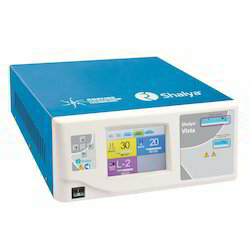 This Product is also known as Digital Electrosurgical Generator, Diathermy for Urology, Electro surgery for Urology, Diathermy for Gynecology, Electro surgery for Gynecology, Diathermy for Laparoscopy Surgery, Electro surgery for Laparoscopy Surgery, Surgical diathermy for Endoscopy Surgery, Electrosurgical Diathermy for Endoscopic Surgery, Endoscopy Surgery Diathermy Unit, HF Cautery Machine, Electro Surgery Unit for Orthopedic Surgery, Electro Surgery Unit for Hysteroscopy, Electrosurgical Cautery for Endoscopic Surgery, Shalya Electro Surgery Unit, Shalya Diathermy, Shalya Cautery, Shalya Electro Cautery. For all the surgeries that are performed under fluid medium like Transutheral Resection of Prostate,TransCervical Resection of Endometrium, Hysteroscopy, Arthroscopic Surgery, Underwater Endomucosal Resection. 2 Bipolar Modes. Max Power – 70W with macro & micro mode. Electro-Cautery specifically designed for gynaecological applications having inbuilt electrosurgery mode, vessel sealing mode & Saline Plasma Resection mode. This Esu is used majorily for gynac application for resection of Polyps and fibroids, Adhesions and septums & Abnormal bleeding & transcervical Resectio. 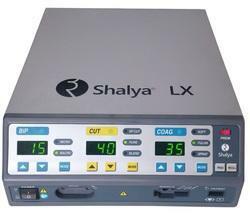 The Product is commonly known as : Monopolar Bipolar Diathermy, Under Water Diathermy, Under Water Cautery, Bipolar Diathermy, Digital Electrosurgical Generator, Diathermy for Urology, Electro surgery for Urology, Diathermy for Gynecology, Electro surgery for Gynecology, Diathermy for Laparoscopy Surgery, Electro surgery for Laparoscopy Surgery, Electrosurgical Diathermy for Operation Room, Surgical Diathermy for Neurosurgery, Electro surgery Unit for Neurosurgery, Surgical Diathermy for Micro Surgery, Surgical Diathermy for Oncology, Electrosurgical Generator for Onco Surgery, Surgical diathermy for Endoscopy Surgery, Electrosurgical Diathermy for Endoscopic Surgery, Endoscopy Surgery Diathermy Unit, Surgical Diathermy for Cardiovascular Surgery, Electro Surgery Unit for Cardiovascular Surgery, HF Cautery Machine, Electro Surgery Unit for Orthopedic Surgery, Electro Surgery Unit for Hysteroscopy, Electrosurgical Cautery for Endoscopic Surgery, Touch Screen Electrosurgery Unit, Shalya Electro Surgery Unit, Shalya Diathermy, Shalya Cautery, Shalya Electro Cautery. 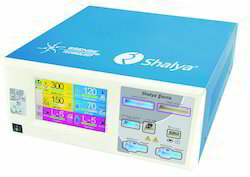 This electrosurgical unit with inbuilt autobip modes which works without hand/footswitch activation makes it the best suited for neurosurgery Application like treatment for brain & spinal tumour, epilepsy, spinal bifida, facial anomalies and congenital spinal defects as well as tumours and other rarer conditions caused due to trauma, Aneurysm repair, Laminectomy, Craniotomy, Carotid artery Endarterectomy. The product is also known as Electrosurgical Diathermy for Operation Room, Surgical Diathermy for Neurosurgery, Electro surgery Unit for Neurosurgery, Surgical Diathermy for Micro Surgery, Surgical Diathermy for Oncology, Electrosurgical Generator for Onco Surgery. This electrosurgical unit with inbuilt autobip modes which works without hand/foot switch activation makes it the best suited for neurosurgery Application like general surgery, ophthalmology, orthopedic surgery, gynecological surgery, otolaryngology ,neurosurgery, oral and maxillofacial surgery, plastic surgery, podiatric surgery and pediatric surgery. An advanced microcontroller based electrosurgical unit with electro-surgery, Saline plasma bipolar Resection mode as well as Vessel sealing mode. This electrosurgery unit is designed for cardiovascular applications like heart valve repair and replacement, heart defect repair, coronary artery bypass, aneurysm repair, heart transplantation. Thus it has two monopolar ports which allows two cardiosurgeons to work simultaneously on the patient. Electro-surgery unit for cardiovascular application This electrosurgery unit is designed for cardiovascular applications like heart valve repair and replacement, heart defect repair, coronary artery bypass, aneurysm repair, heart transplantation. Thus it has two monopolar ports which allows two cardiosurgeons to work simultaneously on the patient. Autobip mode: The power is set automatically without activation of hand or foot switch. Fastest coagulation due to Random Spray coag option. An Esu with inbuilt ENDOcut mode for endoscopic surgeries like polypectomy & papilotomy.The 6 sense microprocessor has 4 cut , 4 coag modes & 4 biplar modes with high impedance bipolar output. PREM Safety: Patient return electrode monitoring – PREM – is ultimate Safety for return electrode site burns. BiCoag Alarms: Audio feedback alarm after completion of Bipolar Coagulation reduces charring & sticking of tissue to forceps & avoids over burning of tissue. 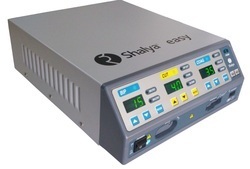 Electro-Cautery specifically designed for gynaecological applications like hysteroscopy having inbuilt electrosurgery mode, vessel sealing mode & Saline Plasma Resection mode. This Esu is used majorily for hysteroscopic application for resection of Polyps and fibroids, Adhesions and septums & Abnormal bleeding. This 300 W electrosurgical unit is used for laparoscopic applications like Removal of diseased organs such as the gallbladder, appendix, colon, stomach, bladder, ureters, Kidney or liver & check the presence of tumors or abnormal condition. · Performs self-diagnosis & ensures that the connected accessories are safe to use. PREMSafety: Patient return electrode monitoring – PREM – is ultimate Safety for return electrode site burns. PREM TM Safety: Patient return electrode monitoring – PREM – is ultimate Safety for return electrode site burns. Performs self-diagnosis & ensures that the connected accessories are safe to use.